Two of the probes zoomed in on the solar wind to probe it in greater detail than ever before for the latest study. Their observations showed the turbulence which is caused due to irregularities in the flow of particles along magnetic field lines. They were flying just 20km (12.5 miles) apart along the direction of flow of plasma, taking 450 measurements a second as they operated in “burst mode”. The results achieved were then compared with results obtained using computer simulations. This confirmed that sheets of electric current exist only 20km across on the borders of the swirling turbulence. Cluster has previously detected current sheets on much larger scales of 100 km (62 miles) in the magnetosheath, the region sandwiched between Earth’s protective bubble called the magnetosphere and the bow shock created where it meets the solar wind. At the edges of those larger turbulent eddies, a process called ‘magnetic reconnection was detected, where oppositely directed magnetic field lines spontaneously break then reconnect with other nearby field lines, so releasing their energy. The latest glorious image of Saturn taken from within the planet’s shadow. (Sen) – The imaging wizards working on the Cassini mission have delivered a Christmas gift to space fans in the shape of this astonishing new view of planet Saturn. It looks unusual because the giant world and its spectacular rings were backlit with the Sun behind them while the NASA probe was in Saturn’s shadow. That is a line-up that happens rarely for the orbiter which has been studying the planet and its retinue of moons since 2004. The last time it delivered such a view was in September 2006 with a picture that was named In Saturn’s Shadow. The two bright dots resembling stars below the rings to the left of the planet are actually two of Saturn’s many moons – Enceladus which spouts salty jets from an underground sea, and Tethys. The heliospheric current sheet results from the influence of the Sun’s rotating magnetic field on the plasma in the solar wind. Solar Wind Variations The solar wind is not uniform. Although it is always directed away from the Sun, it changes speed and carries with it magnetic clouds, interacting regions where high speed wind catches up with slow speed wind, and composition variations. 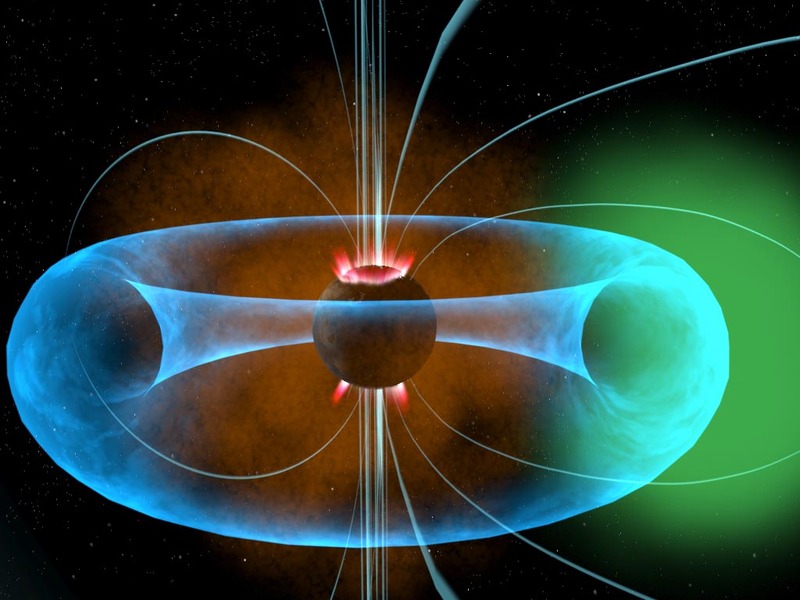 The heliosphere’s magnetic field is responsible for deflecting extrasolar particles, such as makes ups part of cosmic rays, from neighboring stellar sources. There is continuous emission of charged particles, mainly hydrogen ions in a plasma, from the corona outward into the heliosphere and beyond. This is the solar wind which through particle expulsion at high velocities causes these to escape the Sun’s gravitational field and travel great distances outward through the solar system. Solar wind is a stream of charged particles released from the upper atmosphere of the Sun. It mostly consists of electrons and protons with energies usually between 1.5 and 10 keV. The stream of particles varies in temperature and speed over time. These particles can escape the Sun’s gravity because of their high kinetic energy and the hightemperature of the corona. 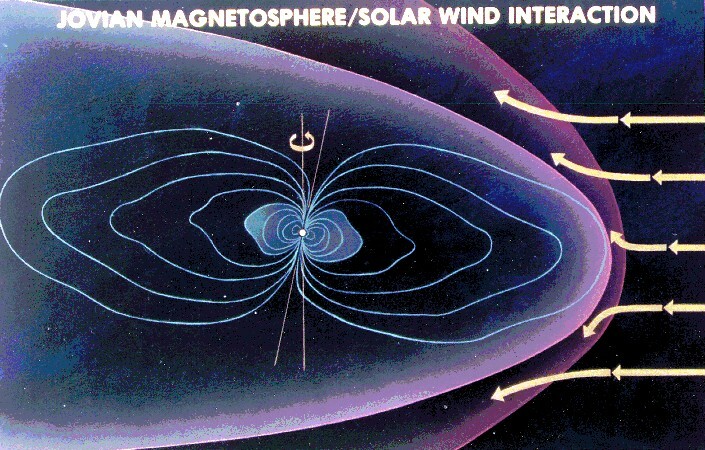 The solar wind creates the heliosphere, an enormous bubble in the interstellar mediumthat surrounds the Solar System. Other phenomena include geomagnetic storms that can knock out power grids on Earth, the aurorae (northern and southern lights), and theplasma tails of comets that always point away from the Sun. This Friday, Dec. 21, the spectrometer will be tracking the path of Venus across the face of the sun from its perch in the Saturn system. Earthlings saw such a transit earlier this year, from June 5 to 6. But the observation in December will be the first time a spacecraft has tracked a transit of a planet in our solar system from beyond Earth orbit. Cassini will collect data on the molecules in Venus’s atmosphere as sunlight shines through it. But learning about Venus actually isn’t the point of the observation. Scientists actually want to use the occasion to test the VIMS instrument’s capacity for observing planets outside our solar system. This graphic shows the path of Venus across the face of the sun on Dec. 21, 2012, as will be seen by NASA’s Cassini spacecraft in the Saturn system. This will be the first time a spacecraft has tracked a transit of a planet in our solar system from beyond Earth orbit.